Last week it suddenly dawned on me that I gone a full month without sewing! :-0 With our lives being a little hectic, I suppose that I had just let it slip. It’s not a good enough excuse really as sewing is my favourite thing to do more than anything, yet I had let myself get hung up on too many other things and had not really been allowing myself any ‘me’ time! So I decided to set up a sewing station(despite our lack of furniture!) and got productive. I recently bought a handful of Simplicity patterns while they were on sale for $3.99 over on Pattern Review. I took advantage of this offer as all of the patterns were at least $15 full price. If you haven’t checked out Pattern Review, you should! I always search patterns on there before sewing, mainly to get recommendations for fabrics and to check for any known fitting issues. I knew that I wanted a relatively quick make that would be easy to put away when it came to cooking that evening. 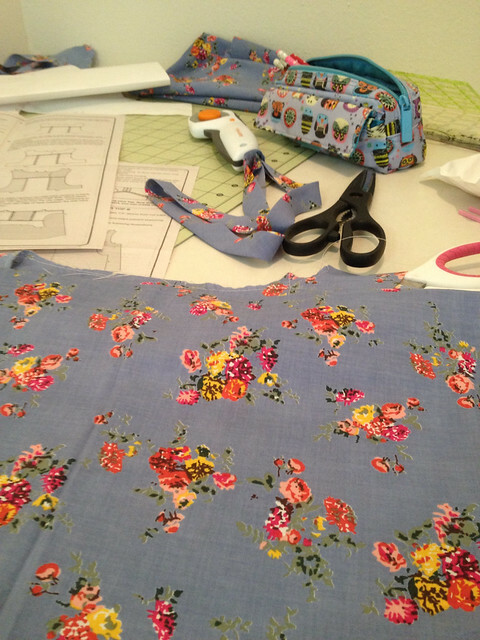 I chose the Simplicity 1589 as it was labelled ‘Easy to Sew’. I really wanted this to be made out of some of my metre fabric cuts but I just couldn’t get it to work on the narrow cuts of fabric. However, I did have just over a metre of a wider thin cotton fabric. I cut a size 12 based on the finished measurements and set off sewing on our little alcove. 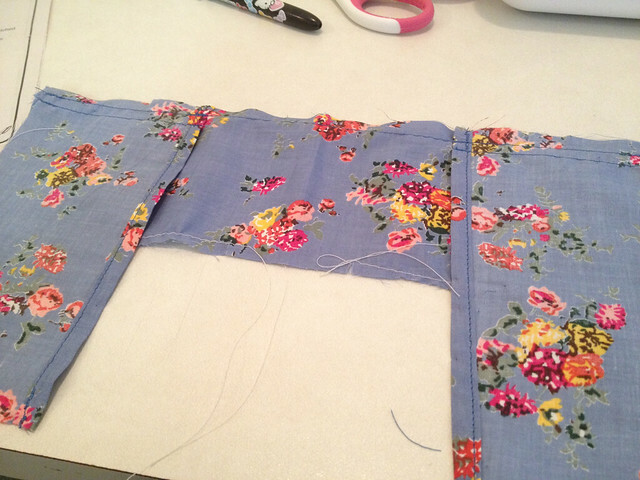 The sewing process had a good start and a good finish. The middle part was a bit squiffy! I like patterns to be clear and precise. Most of this one was but when it came to constructing the back, I found that some of the seam allowances were missing so the instruction ‘stitch the seam’ wasn’t so simple. I ended up pinning it with the two seam options available and went with the one that allowed the side seams to match up. 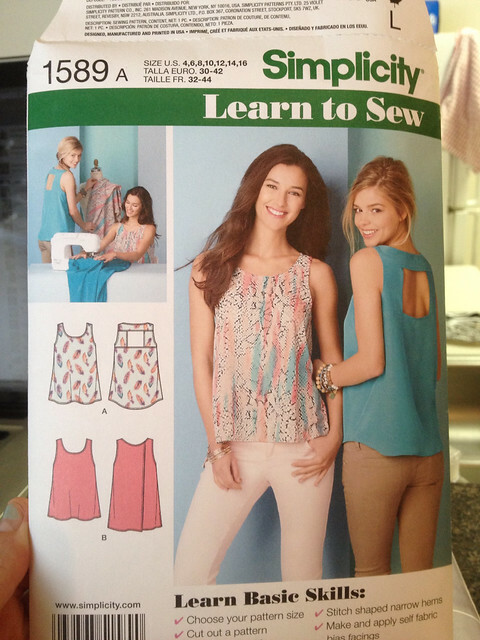 The completed top is perfect to wear with jeans or shorts. 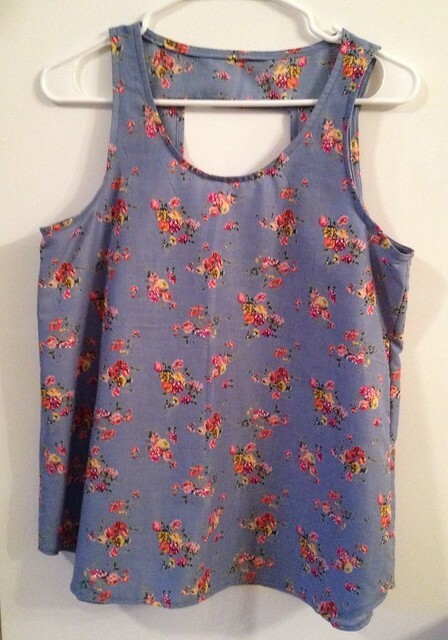 It’s a lovely top for the Summer; nice and light. I would like to make this using some of drapey fabrics that I have in my stash but I’m not sure how that would go with the amount of pressing that is needed in this make. 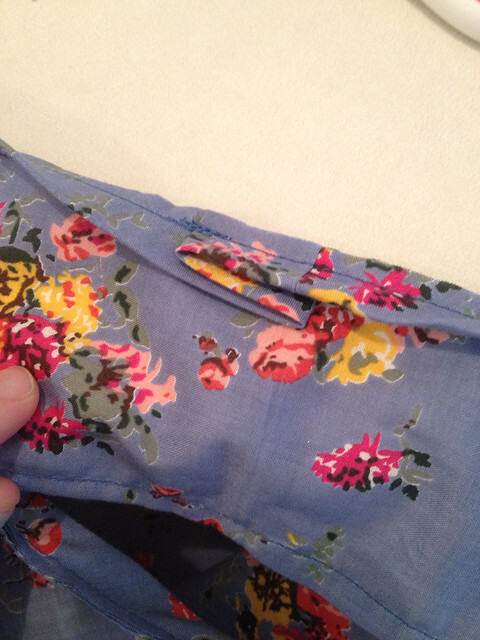 I find that some of the polyester type fabrics don’t hold the creases when they are pressed. This would make the facings a little tricky. The top is a bit big under my arms but I’m hoping I can alter that for future makes of this top. Just as a little extra, I hoping to refine a blog a little more and concentrate on better content. I’ve changed the theme (again!) and I think I’m actually happy with this one. Simple but pretty. Hope you all like it! Talented Tuesday Link Party – No. 26 – NEW HOSTESS NEEDED!!! Thank you 🙂 I am a little in love with the fabric! I know 😦 I couldn’t believe it when I realised! I’m motivated to get other stuff done now so I can make time for more sewing – I need more clothes!! Yes I thought the same too, I’m surprised at how much it does go with actually so I’m sure it will worn out 🙂 Maisy is much better thank you…though it is very hard to get a puppy to rest! PS forgot to mention your new blog style/layout! Love the pinky colour, looks sleek and easy to navigate. I looked at it on my phone but went into ‘normal’ view as the reader didn’t show it properly. Well done! This is so pretty! I’m sure you’ll get a lot of wear out of it. I often think I should get more into sewing smaller, “practical” things, because I can’t wear half of my handmade stuff on a daily basis – a lot of the dresses, for example, are a bit too extravagant for that. Thank you 🙂 I’m aiming for more wearable makes too! I had a couple of things in my wardrobe that I had not even worn since making them 😦 I couldn’t even alter them to be more wearable so they have ended up going to the charity shop! Very cute and will be fun to wear! Come on, summer! Looks very cute. I love your fabric. 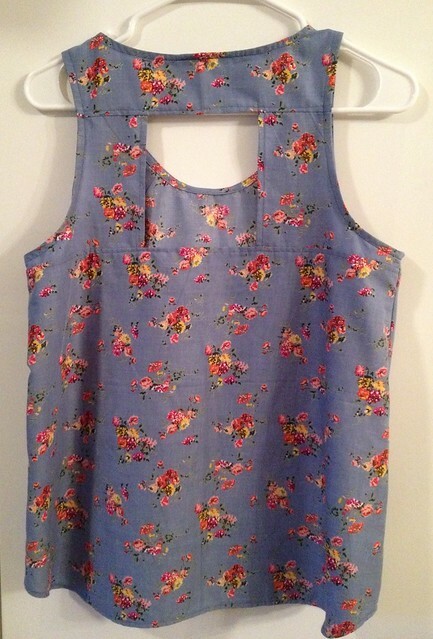 We don’t quite have summer weather here, but it’s never too early to sew for summer! Love the fabric and I think the finish of this top is very neat and professional 🙂 Bet you will get loads of wear out of it during the warm Alabama summer! Pingback: Talented Tuesday Link Party #27 - Cook. Craft. Love.